PAC-MAN Smash Slimline is Bandai Namco’s latest incarnation of the unique PAC-MAN Smash air hockey game. The Slimline table has the same game play at a lower cost with a slightly smaller footprint. PAC-MAN Smash puts a new twist on the classic arcade game. Up to four players can play simultaneously in a frenetic battle of the pucks. The game starts out with one regular sized puck to get the players warmed up. After a side has scored a goal, the puck is automatically returned to the alternate side of the playfield. Randomly throughout the game, dozens of mini pucks will spill onto the playfield causing a scoring frenzy. PAC-MAN Smash Slimline has simplified mechanisms but with the same PAC-MAN branding, play field and PAC-MAN sound effects. The Slimline table has the same game play at a lower cost with a slightly smaller footprint. PAC-MAN Smash puts a new twist on the classic arcade game. Up to four players can play simultaneously in a frenetic battle of the pucks. The game starts out with one regular sized puck to get the players warmed up. After a side has scored a goal, the puck is automatically returned to the alternate side of the playfield. Randomly throughout the game, dozens of mini pucks will spill onto the playfield causing a scoring frenzy. 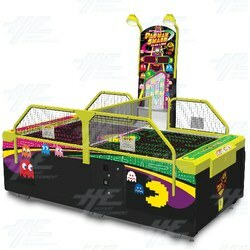 PAC-MAN Smash Slimline has simplified mechanisms but with the same PAC-MAN branding, play field and PAC-MAN sound effects.